We already know that Dubai is buying an army of police robots, equipping its firefighters with jetpacks, and patrolling its streets with autonomous cop cars. Now it wants its officers to roam the futuristic city on hoverbikes. It first announced its intentions just over a year ago at the Gitex Technology Week in Dubai — and now it’s started training its fuzz to ride the Star Wars-esque vehicles. 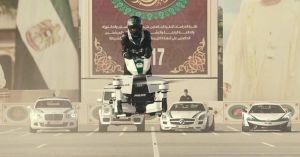 According to CNN, Dubai Police are now training two crews to pilot the hoverbikes. They’ll reportedly use them to reach hard-to-access areas, track suspects, and patrol tourist destinations. The company behind the hoverbikes is California-based startup Hoversurf. Its FAA-approved Hoverbike is essentially a cross between a motorcycle and quadcopter, with a capped max speed of just over 70 km/h (43.5 mph). You can pre-order one yourself for just $150,000. But as you’d imagine, budgets aren’t tight in Dubai. “[Dubai Police are] going to let us know in the next month or two if they’d like any more … If they would like 30 or 40, we’ll make it happen for them,” Hoversurf chief operating officer Joseph Segura-Conn tells CNN. While the hoverbikes look pretty fun, their range is still pretty limited, with a flight time of only 10 to 25 minutes. We have yet to see how a such a futuristic mode of transportation could actually be helpful for law enforcement in the real world. But hey, we’re not going to stand in the way of the future. It looks freakin’ awesome.